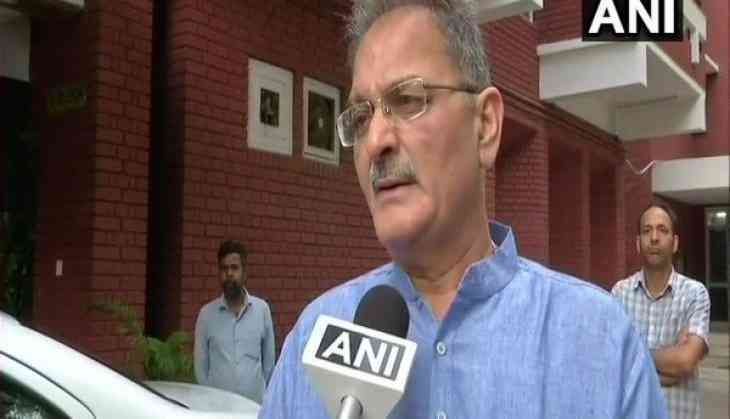 Ahead of a major reshuffle in the Jammu and Kashmir Cabinet, Deputy Chief Minister-elect Kavinder Gupta on Monday said that he would prioritise work in Jammu, Kashmir, and Ladakh regions. "The party gave me the responsibility to bring in change after three years. I'll try my best to meet the expectations of people and our priority will be to work for Jammu, Kashmir, and Ladakh," Gupta told ANI. Speaking on the unusual alliance between the People's Democratic Party (PDP) and the Bharatiya Janata Party (BJP), Gupta said that the public of the state had chosen both parties, "We had entered into an alliance, following people's mandate. I hope it keeps working and delivers on people's expectations." Meanwhile, the outgoing deputy chief minister Nirmal Singh expressed confidence in the new ministers to be inducted later in the day. "The government has worked well for three years. I am sure the new ones will perform very well," Singh told ANI. His decision to resign came after the party's decision of Cabinet reshuffle, "It was the decision of the party to change roles. Keeping in line with that decision, I stepped down." According to sources, Singh will now be made a Speaker. The BJP is expected to bring in some new faces in the much-awaited reshuffle in the Mehbooba Mufti-led Jammu and Kashmir government, scheduled at noon. On April 17, the BJP had asked all its nine ministers in the state government to submit their resignations to enable the party to bring in new faces. The state can have a maximum of 25 ministers, including the Chief Minister, out of which 14 portfolios are with the PDP and the remaining with the BJP.